Both Posse organizations will be involved in Vacation Watch duties in Sun City West. Myron Finegold, Sheriff’s Posse of Sun City West commander, said his organization has submitted paperwork to the Arizona Secretary of State to incorporate their second posse organization. 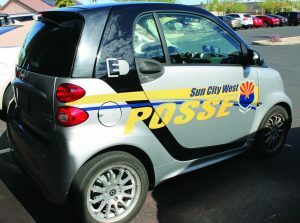 Sun City West Posse has two Smart Car vehicles assigned to vacation watch duty, and one of them is all electric. It will be known as Sun City West Posse, and will operate in conjunction with the MCSO Posse. “But no one from outside can shut down our organization so we can’t patrol our community’s streets,” Mr. Finegold said. The new organization will not report to any elected official. The vehicles will have different markings, and the uniforms will be different. The new organization will have gray shirts and black pants to contrast with the tan shirts and brown pants of the MCSO posse. 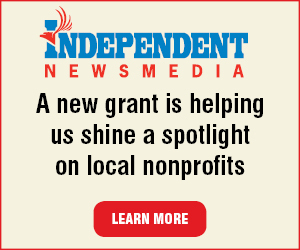 There is a large section of questions and answers about how the two groups will function in the next edition of the Sun City West Independent.